At the age of 14 I travelled around China dressed as a cockatoo. It was 1993 and China was a very different country. Different from the country we know now, undeniably. Different to my little world in the southern suburbs of Sydney, absolutely. It was before the high-rises, industry, and cars of modern China. Instead it was a frenzy of bicycles that clogged the streets. In laneways, street vendors sold Nike knockoffs with little care for design or quality, because there were no originals for anyone to compare them to. There was no sign of multistorey shopping centres. Between performances we would travel to the mighty architectural and historical triumphs of China’s past like the Forbidden City and Temple of Heaven. I walked along a stretch of the Great Wall, wrapped in winter woollies, and peered through the gaps in the parapet at the expanse of icy land below. I stood in Tiananmen Square, marvelling at the imposing image of Mao, and remembering grainy video footage of tanks and protesters. For a child of 14 this was awe-inspiring. In addition to my wonderment at the otherness of China, I was experiencing wonder at my own personal development. In theatres, schools and community halls across China, our little youth theatre troupe from Shopfront Theatre for Young People was performing twice daily to enthusiastic audiences. I played a cockatoo, a part I revelled in as my character left the confines of the stage to interact with the audience, in a family-friendly play that had been devised by our director. In another play, self-devised by our performance troupe and aimed at teenagers and young adults, we addressed lofty issues of identity. At the end of these performances there were kids my own age rushing up for my autograph. They too had been attracted by otherness. Last week I found myself at Shopfront Theatre for Young People once again, after a 20-year hiatus. Shopfront was celebrating its 40th birthday, and it too had undergone drastic change with the passage of time. In 2015 it had relaunched as Shopfront Arts Co-Op to better reflect the diversity of arts they now offer to young people including performance, filmmaking, writing, and physical theatre. As I strolled across the theatre stage my nostalgia gushed over, and I spoke with the CEO, Daniel Potter, about the things that I remembered from my teen years. Murals still adorn the walls as they always did when I was a kid, but now everything seems brighter, more dynamic. There are beautiful new spaces, impressive technology, and an office brimming with staff dedicated to developing the creative voice and confidence of kids. Shopfront is one of the few arts communities to have survived the recent government funding cuts unscathed, and the community will now benefit from even greater space and support for children to reach and exceed their creative potential. Shopfront is where I first flexed my creative muscle. It was a space that celebrated otherness, where bohemians, oddballs, artists, and imagineers could find creative sanctuary. Now my creative work centres around issues of identity, particularly post-soviet identity in Central Asia. I can never really be sure of how a creative idea finds a person (because it is never the other way around), but I think that my time breathing in the otherness of Communist China, and feeling nurtured to express myself and my own otherness through the arts at Shopfront would have had a hand in it. 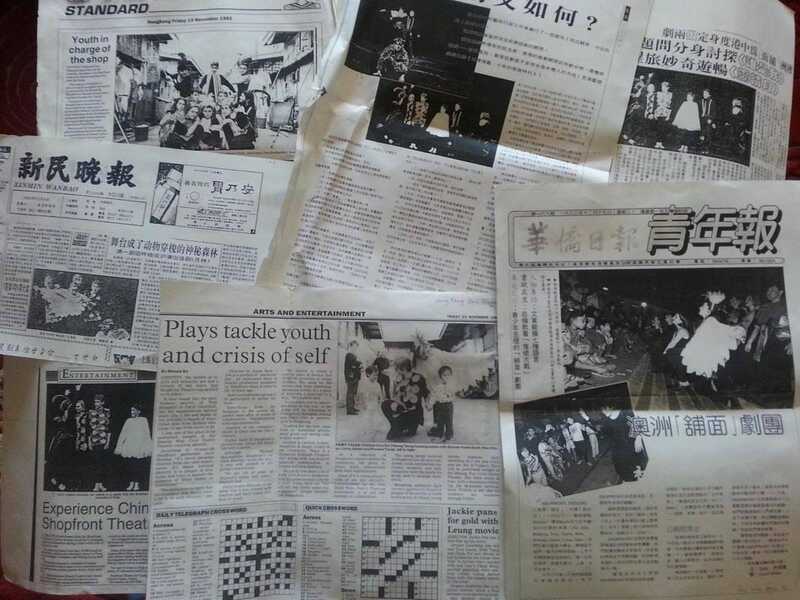 Newspaper clippings from Australia, Hong Kong, China and Japan. Shopfront Theatre Tour, 1993. I had my arse kicked last night. By myself. I am very flexible. I have let nearly a year slip by without updating this blog. For shame. I am looking in the mirror and quietly judging myself. I never realised how scary I look when I am angry. But last night I went to a fabulous presentation at Sutherland Shire Library which has given me cause to put fingers to keyboard and reinstate some long overdue blogging. A big thank you to Walter Mason on his intro to publishing lecture that stressed (amongst other valuable titbits) the importance of having an online presence. And so here I am again. Frustrating as it might seem, the literary landscape demands so much more from aspiring novelists than a read-worthy manuscript. Building online networks are just as important as building networks in real life, and it is now expected that authors will be proactive in this space. I reluctantly dipped my toe earlier this year and set up a public Instagram account as my writerly self, and found the experience surprisingly pleasant. There is a not-so-secret community of writers with their #amwriting and #writersofinstagram hashtags that I have discovered to be delightfully supportive. While their end game is of course to raise their own public profiles, and increase likes and follows, there is a real sense that they are likewise looking to connect with other writers in what is an otherwise lonely business. It has been a big year for moving things forward with my novel, and although much delayed, I am creeping closer to the end of my first draft. Yes, my FIRST draft. There will be more. Many, many, many more. But I am close enough now to be thinking about what happens next, and to be frank, it is a little scary. While the only words I want to be typing are the ones that fill the scenes in my novel, the realist in me knows that I have to put on my big girl pants and embrace all aspects of the literary scene, including the online space. Follow me on Instagram @writerowena for literary related pics, occasional book reviews, and the odd cat.